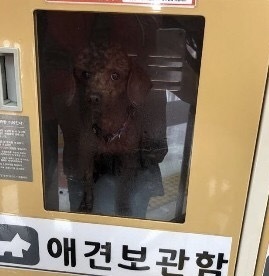 A recent incident in which a pet owner left his dog inside a Lotte Mart pet locker in Jeonju, North Jeolla Province has sparked a row between animal welfare groups and the authorities, with many people calling for an end to animal abuse in Korea. Other people, however, have spoken on behalf of the pet owner, claiming that the lockers at Lotte Mart are for the safety of pets as well as that of the public. According to the police and Lotte Mart authorities, the 32-year-old pet owner entered the local mart at 10:30 a.m. Sunday after putting the poodle in the locker. A customer discovered the neglected dog at approximately 2 p.m. and shared the incident, along with a photo, via an online site. The attached photo showed a brown poodle inside the cramped space. The customer reportedly saw the dog breathing out warm air, which left deposits of fine dew on the glass surface. After several hours, the employees called the police to report the incident at approximately 7:38 p.m., which prompted the owner to retrieve his pet. The pet owner claimed that he had intended to leave the dog while shopping for food, but received an “urgent call from work” and thus left in a hurry to Seocheon county in South Chungcheong Province. In a response to the growing criticism, Lotte Mart has begun taking down pet owners’ names and contact information to prevent further cases. They also plan to draw up measures in expanding the size of pet lockers, a Lotte Mart official said.